If you have not followed the story, Elon Musk, the CEO of Tesla was accused of committing fraud by the SEC September 27th, 2018. Musk didn't fight the charges in court to prove his innocence. Rather, he settled with the SEC and accepted the terms of a court-approved mandate with three conditions. 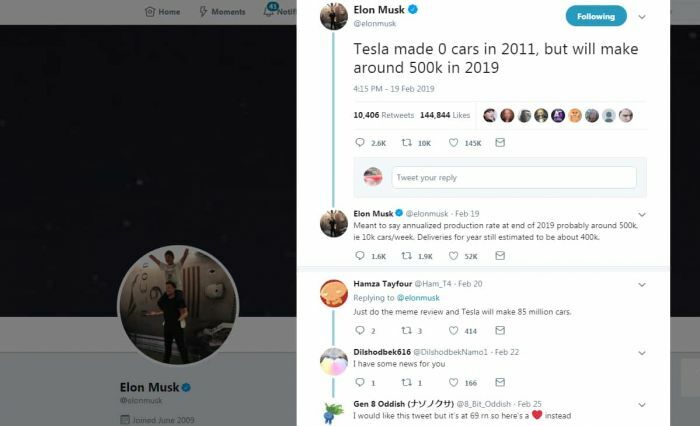 That he not be the the Chariman of the Board of Tesla for three years, that he pay a $20 million fine, and that he clear any tweets or other written communications that are considered material to shareholders with an internal regulator. The last part of the agreement is where Musk is accused of going wrong most recently. Musk's tweet on Tuesday Feb 19th, 2019 at 4:15 pm is problematic for many reasons. First, it is impossible to argue that this information is not material. Musk is the company's CEO. He reported in public, and in writing the projected volume, and thus, the projected revenue, his public company would have in an upcoming period. Tesla's production forecasts have been a significant part of the company's news over the past few years. Tesla has even produced graphs showing projected production, which it then missed by many months. The reports are also widely reported by EV advocacy media, including those with a stake in the company's success or failure. Second, the information he reported was a significant exaggeration. Need proof? See his second text below that one saying it would instead by lower. That second tweet is also a violation of the agreement with the court. Third, the written materially-significant written communications were not pre-approved by Musk's internal regulator. Who, by the way, quit his job at Tesla the next morning. Here's the real problem for Musk, and by extension, Tesla, Inc. Musk cannot argue in good faith before the court that this tweet was a mistake, or accidental, or that he thought he had cleared it with the regulator and was mistaken. Because, according to the SEC, he never cleared a single communication - not one - with the regulator. Over five months of almost daily tweets and other communications. Musk seems to have simply ignored the court-approved mandate that he himself had agreed to as a settlement of a fraud allegation against him. You can read the full SEC court filing here at this link.